There's an old joke that starts with a question. Guy asks a store owner, "Hey, how's business?" Store owner pauses before delivering the punch line. "Well, as they say in the garbage-collection industry, 'It stinks—but it's picking up.'" Get it? Recology gets it. For the San Francisco–based Recology, the stinky business of garbology is really picking up. The pioneering trash company, a national and international pace-setter when it comes to landfill-diversion strategies (most notably through its composting initiatives), has just completed the purchase of the North Bay's Ratto Group and is poised to start rolling the trucks and picking up the trash within the next few months, from Santa Rosa to the wilds of West Marin. The company's been around for more than 100 years and started as a scrap-scavenging outfit in San Francisco, where, according to corporate materials, it still holds the exclusive contract to deal with that town's epic waste stream. The firm also recently signed off on a garbage-collection contract in Humboldt County, filling in a previously empty coastal zone on a company map that's dotted with Recology outposts in Washington, Oregon, Nevada and California—but none in the North Bay. Until now. The company has had its eye on the golden coastal swath that runs from San Francisco to Eureka, says Eric Potashner, the San Francisco–based vice president and senior director of strategic affairs at Recology as he notes that "these opportunities don't come around that often." And the process in Santa Rosa to replace Ratto with another firm has been a bit awkward, to say the least, as Recology was initially rejected in a request for bids sent out by Santa Rosa earlier this year, when it picked two other companies as finalists, even as Recology was negotiating to buy Ratto. Santa Rosa—and the county as a whole—has cited multiple failures on Ratto's part to fulfill the contract as their reason to not re-sign the locally based company, whose subsidiary trucks roll around the North Bay under the banner of Redwood Empire in Marin County. Those failures included a demonstrably poor track record of diverting recyclables from regional landfills. 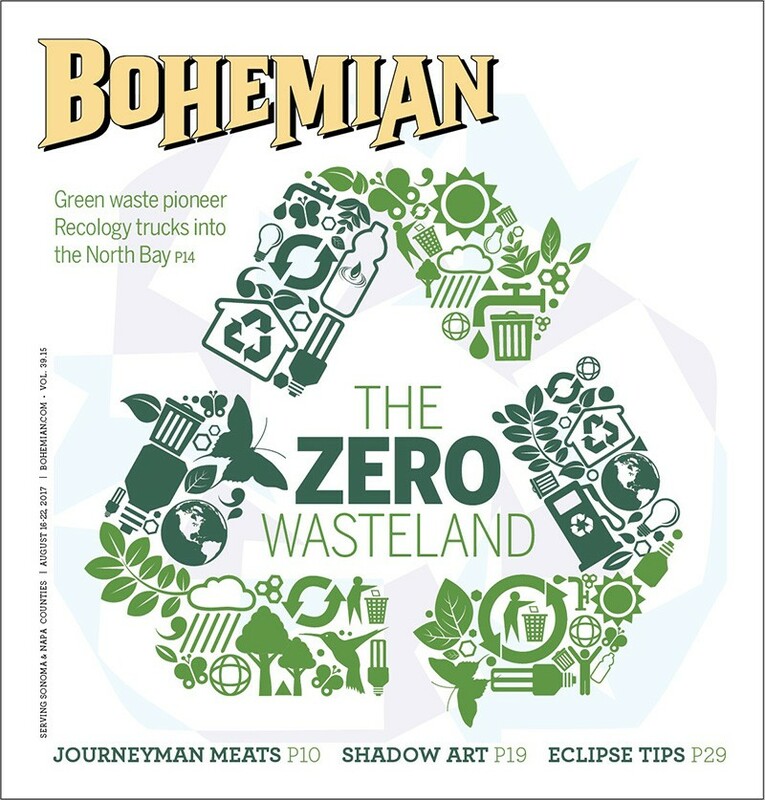 In April, Santa Rosa was poised to pick between the nation's number-one trash hauler, Waste Management, and local upstart GreenWaste Recovery, when Recology chimed in and told the city that they were in the final push to purchase the just-unionized Ratto, even as Santa Rosa was about to pick someone else to pick up the garbage. The Santa Rosa City Council (SRCC) then nixed the two original finalists and allowed Recology to resubmit its bid, when it promptly became a finalist. As of Monday, Aug. 15, the Santa Rosa city manager's office had recommended Recology to the SRCC, which will take up the recommendation and likely approve it at its Aug. 29 meeting, according to the city website and Joey Hejnowicz, the administrative analyst for the city manager's office who is charged with the nitty-gritty of the Recology contract rollout. Recology has made its bones in the trash business by preaching and practicing a philosophy of radical food-waste diversion, which it pioneered in San Francisco in the early aughts when it launched a composting program that would divert food and yard waste into composting facilities and then into the rows at local farms, providing top-notch soil for ground cover. The company's corporate cri de coeur is "zero waste," a laudable objective that's been taken up by municipalities and counties around the state—but not by Sonoma County. Marin County has set its zero-waste goal for 2025. Zero waste is a tough nut to crack given the practical limitations of current curbside, street-bin sorting systems. But industry leaders and garbologists have noted that the multiplier impacts in eliminating food and yard waste from the landfill stream goes far beyond any benefit that recycling provides. The purchase (Potashner averred on offering the final sale price) included all of the Ratto assets, he says, including the machinery, trucks and real estate. The current garbage-collection matrix in Sonoma County has proven inadequate to the demands of residents and civic leadership to reduce landfill-bound waste and achieve a zero waste outcome. Even if the county hasn't embraced the concept as a policy mandate, Sonoma County did host its first-ever zero-waste summit in May. It's a start. Compared with Ratto, the Recology business model appears better poised to deliver on recycling and composting, but will it? Potashner notes that the Ratto Group just upgraded its recycling facility in Santa Rosa. "That is in much better shape than it has been in 10 years," he says, and notes that Recology plans "to add some capital improvements" to ensure that waste that winds up in those blue recycling bins stays out of the landfills. The recycling and waste-transfer stations are where that particular rubber hits the zero-waste road, and a better recyclables yield, Potashner notes, comes through employing the latest technology, which for Recology includes optical-sorting scans and new screening tech. "That does move the needle forward insofar as what you can do on the recycling end." But landfills are typically filled with 30 to 40 percent organic matter that creates methane and all sorts of environmental havoc on the global-warming front. Composting food and yard waste is key to achieving the zero-waste goal. "The other side is the composting," says Potashner, "and we are going to expand those operations on the North Coast as well—we intend to provide an organic solution that frankly hasn't been there."